Szalai Nóri | 17. 01. 19. This is a colour photo of a mother and her baby. I think it was taken in a supermarket, because the baby is sitting in a trolley. They are at the fruits and vegetables department of the supermarket. The baby is wearing a blue T-shirt, so I guess he is a boy. 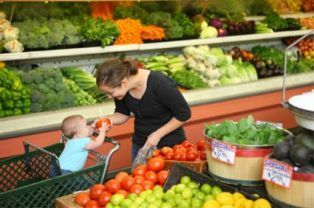 The mother - who is wearing a black top - is picking up some vegetables for dinner. She is giving a tomato to the baby at the moment. Both of them are smiling. I think the baby is around 8 months old, so he is old enough to eat vegetables and fruits. Maybe he likes tomatoes, that’s why he’s so happy. Besides the tomatoes I can see a lot of different vegetables. From left to right there are green peppers, broccoli, cucumbers, cabbages and eggplants. In front of the mother I can see lemons, limes, spinach and avocados. In this picture I see a young couple. They are comfortably sitting on a sofa in the livingroom. They are looking at a thick magazine or some kind of album with pictures. They probably have shared interests and they are spending their free time together. Reading together can be a very good way to relax after work or in your free time. But lots of people prefer to watch TV or movies at home or at the cinema. There is an open laptop on their coffee table between two red mugs. Maybe later they will watch a movie on it. They might also look for some programs in the city, like concerts or theatre performances. However, not many young people go to the theatre nowadays and they almost never go to the opera or to see a ballet performance, for example. Instead it is more popular to spend hours in front of the Internet. We seem to forget that we could choose from a variety of hobbies. Listening to music, playing some instrument, painting, going to the library to borrow books, horse-riding, taking dancing lessons and so many more. In this picture I can see a fighting couple and between them is their son covering his ears with his hands. He probably doesn't want to hear his parents shouting at each other. Unfortunately, this is not a very surprising situation because it reminds me of the fact that the number of divorces is increasing year by year. First of all, it is more and more fashionable to remain single and unmarried as long as possible. Everybody is building their careers, living their lives, enjoying their freedom and they do not believe in long-lasting marriages or relationships as much as the earlier generations did. In addition, many of those people who were brave enough to marry and have a family have divorced after a couple of years or are thinking of it at present. 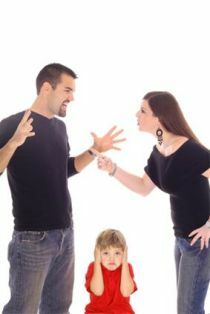 This results in many single parents or middle aged people with no kids at all. And children who experience a divorce will probably not believe in the institution of marriage either. So, we are heading towards a world of many single and perhaps lonely people. No wonder nations are dying out. It is interesting, however, that this is mainly characteristic of western and industrialized countries. Even in these countries, it is more likely that more children will be born in a family that has a lower life standard than in one where they could afford having a larger family. Perhaps in a poorer family, where many generations have to live together, the concept of 'family' is stronger and they value it much more. In families such as these, the older generations, the grandparents, are also paid more attention to and they are respected and cared for. In western countries it is more commonplace that the grandparents go to a nursing home, the parents are divorced, lead individual lives and the children live on their own from a very young age. Perhaps because it can be afforded. It does not seem to strengthen family ties. Thankfully, there are always exceptions and sometimes people do find the right kind of partners, have children and bring them up to respect the elders and learn from their wisdom. This way, they are raised to respect 'the family', are less likely to turn to drugs, to turn into criminals or lonely sad people and can be the type of people that are a hope to a nation.